Check out how to make these Spooky Skeleton Cookies below.. In medium bowl, stir together cookie mix, flour and cocoa. Add butter and egg; stir until soft dough forms. On work surface sprinkled with flour, roll dough 1/4 inch thick. Cut with 4-inch gingerbread cookie cutter. Place 1 inch apart on ungreased cookie sheet. Bake 6 to 8 minutes or until set. Cool 1 minute; remove from cookie sheet to cooling rack to cool completely. In medium bowl, beat meringue powder and cold water with electric mixer on medium speed until peaks form. Gradually beat in powdered sugar about 1 minute or until soft peaks form. Place in 12-inch piping bag fitted with #3 tip. 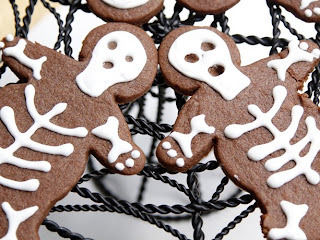 Pipe skeleton design on cookies. Let sit about 5 minutes or until icing is set. Recipe can easily be doubled or tripled. Store uneaten cookies in airtight container.